Is Samsung Chromebook Series 5 550 worth spending $549? Google and Samsung couldn't have done more to hide the second-generation Chromebook and new Chromebox during Consumer Electronics Show 2012 in January. 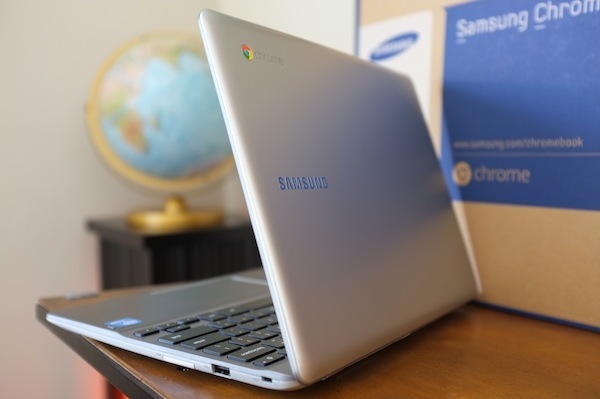 They're cloaked no longer, as I explain in my "Samsung Chromebook Series 5 550 first-impressions review". The products launched today, and they're worth a look. But is the new Chromebook worth buying? Everyone should ask first about performance, because by the specs Samsung's new Chromebook is an under-performer -- Celeron processor in an Core i-processor world. But there are different measures of performance, and only one really matters: Is it good enough for what it's meant to do? I partly answer the question in my review, but the topic is so important for this computer I've dedicated another post just to it. Quick answer: Performance is good enough. However, price-performance is another matter. For two months last summer, I used the original Samsung Series 5 Chromebook as my primary PC, in the first weeks and as my only one later on. The cloud experience was refreshing, no liberating, but Chromebook grated the longer I used it, because of performance. There was too much lag, and video playback was too choppy. At the least, Chromebook needed 4GB of memory, rather than two, faster processor and better graphics chip. The new model has the memory chops and perhaps good-enough processor and graphics chips, by the aforementioned measure. I use "perhaps" because the real test is time -- performance a month from now or longer. Google got what could have been a disastrous luck of the draw, sending me a Chromebook to use ahead of today's launch. I moved form a smoking MacBook Air, which places high measure for comparable user experience performance. MacBook Air specs: 1.8GHz Intel Core i7 processor; 11.6-inch glossy display (1366 x 768 resolution); 256GB flash memory; Intel HD graphics; 4GB SDRAM; webcam; two USB ports; Thuderbolt port; WiFi N; Bluetooth 4.0; iLife '11; and OS X Lion. Chromebook 5 550 specs: 1.3GHz Intel Celeron 867 processor (dual-core); 12.1-inch matte display (1280 x 800 resolution; 300 nit); 16GB solid-state drive; Intel HD graphics; 4GB SDRAM; webcam; two USB ports, DisplayPort; WiFi N; 3G (one some models); Gigabit Ethernet; 4-in-1 media card slot; and Chrome OS. The operating system stack supports Bluetooth, which therefore can be added by dongle. Based on the specs, I absolutely prepared for huge letdown, but didn't get it. Instead, I'm surprisingly satisfied with my first week using the new Chromebook. Always. My first open tab went to Hulu, so I could see if video streaming had improved. Considering that through Google's subscription program, education is a target market, video streaming needs to be excellent. Students will demand it for leisure and study. Video also is excellent measure of overall performance, without benchmarking, which I never do since it's often poor measure of real-world usage and primary value is comparing devices. Verdict: Video delivers. Overall operation is smooth, even with a dozen or more tabs open. In fact, BetaNews website opens much faster on this machine than the Air. We've got a couple banner ads running recently that just slog down main site opening, or so I experience on the Apple computer but not the Samsung. Bottom line: For the last week, the new Chromebook wasn't just my primary machine, it was my only one. I'll spend all of June using this computer, unexpectedly beginning a repeat of last summer's two-months with its predecessor. The switch is easier because so much of what I do is in the cloud, compared to last year, and the overall experience is so improved -- and that's because of software as much as hardware. The 550's specs generate strong gut "this can't be good enough" reaction, but my experience is satisfaction. Remember, I came from using MacBook Air and expected a dim user experience by comparison. Techdom is too obsessed with specs, something vendors perpetuate in their product marketing. I could use many examples to refute the more-is-better myth, but for this audience Xbox 360 works. Microsoft started selling the game console in November 2005 and there have been no major platform updates since. Today's Xbox 360 is much the same as the original; yes, Microsoft tweaked hardware along the way. Gamers pine for more, but who complains the console underperforms? Rather, the games keep getting better as does the overall user experience. Microsoft improves Xbox 360 by way of software updates and cloud services. Then there are platform extensions, with Kinect top of list. The motion sensor radically improves the overall user experience without changing the core platform. This is how you should see Chromebook, as a category. Google has set a hardware baseline, with the big benefits coming from improvements to software and services, similar to the Xbox and Xbox Live ecosystems. New Chrome OS versions closely track browser development, which revs a new version about every six weeks. Chromebook Series 5 550 ships with v19, but v20, which is in the beta channel, offers Google Drive integration. Last month, my colleague Tim Conneally aptly observed that the newly launched Google Drive is "perfect for a Nexus tablet". The feature is as good, if not better, for Chromebook. But there's another consideration -- price to performance and how it compares to other choices. That's where Chromebook crumbles for many potential buyers. The newer Samsung sells for more than its predecessor when released -- $449 vs $429 for the WiFi model and $549 vs $499 for 3G. Compared to MacBook Air, which starts at $999 and the model I have $1,649, price to performance is quite favorable. But, by the specs, there are plenty of lower-cost options. Hell, in my local Best Buy on Saturday, I saw an ASUS laptop (not netbook) discounted to $249. Then there are the tablets. San Diego school district is readying 25,000 iPads for classrooms in the autumn. Education is one of Google's primary target markets. iPad 2 sells for $399 and newer Apple tablet starts at $499. New iPad's high-res display, 2048 x 1536, decimates Chromebook 5 550 for readability and overall user experience. Even compared to many other currently selling laptops, screen resolution lacks and will, by comparison, look less appealing when new Windows 8 laptops ship in a few months. That's perhaps the important distinction when making the Xbox comparison. The 360 was state of art in November 2005. The 550, as flagship second-generation Chromebook launch model, falls behind even as it starts. Much depends on how far Google can extend the user experience with ever-more and quickly-improving software and services. I'm confident Chromebook 5 550 will satisfy most of my computing needs through the end of June. But the computer is not for everyone -- whatever is, eh? Did you see the price? $549 is way, way, way beyond my price range for such a thing. If that will be the final price, I'll likely buy a cheap notebook and throw Linux on it instead. Not as good as a Chromebook (fast boot, no maintenance) but good enough. I always thought that these things would end up being $200 or so. Oh well. Fay is a good measure being an educator and education being one of Chromebook's primary target markets. As a long-term performance investment, $549 is potentially quite rich. As previously stated, much depends on Google making more of what buyers have got. However, for businesses or schools, pricing is different. Google launched the original Chromebook with a multi-year monthly subscription plan, but that goes away today. Under the new scheme, businesses buy the device at the manufacturer's suggested retail price plus $150. For schools it's MSRP plus $30 per device. The extra fee covers maintenance and other service fees. Performance is there today and hardware upgrades promise continued performance for price in the future. Chromebook subscription looked like a good value, now it's gone. Demand will drive down selling prices, as Samsung and other Chromebook OEMs increase production and economies of scale kick in. Looks to me like even second-gen Chromebook buyers will pay a price premium for being early adopters. What else can explain price increases for a category many people expected declines? My mom uses the Cr-48 Chromebook, and I planned on buying her a new one. But even $449 is rich. Mom's worth spending that much, of course. My concern is rapidly diminishing value over time. How I feel after a month using the Series 5 550 Chromebook will weigh in my decision for her and final recommendation to you. For now, I'll say that performance satisfies. I am less encouraged about price-to-performance value now and in the future. However, I see huge price-to-performance value in $329 Series 3 Chromebox, which also launched today.